Black Host Key (bottle opener + magnet + corkscrew in one!) by W&P Design, Wood Sage and Cardamom scented Monokle candle, Honey Hutch lavender lip balm, Honeycomb & Neroli bath fizzy by Formulary 55, Coconut Bath Soak by Herbivore Botanicals, Set of hand painted coasters by EsselleSF, Gold dipped bud vase by Honeycomb Studio, Champagne Hangover under eye gel by Roots & Blooms. Packaged in our signature pale grey gift box with a custom embossed black band. 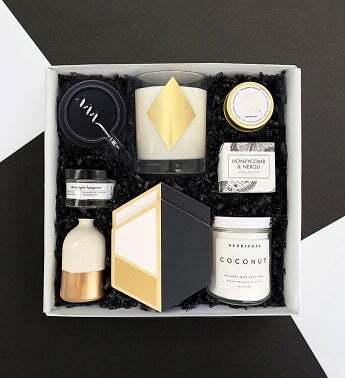 Black, white and gold make the perfect color compliment to this elevated gift. Packaged in our signature pale grey gift box with a custom embossed black band.